TIBERIA is the new wood boiler flame reversed and is a practical solution to conventional gas or oil. It is called reverse flame or flame reverse for the location of the combustion chamber, placed below the compartment in which is loaded the wood. 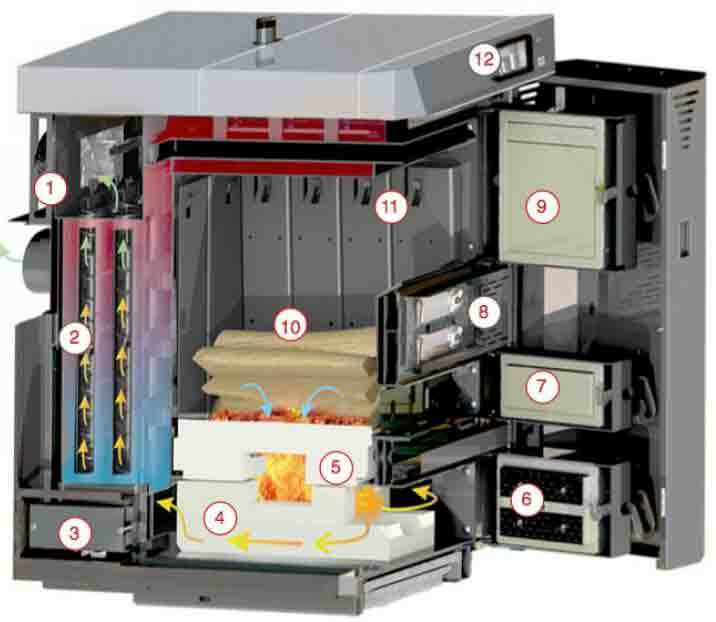 The large combustion chamber ensures a long autonomy of heating and convenience in handling. 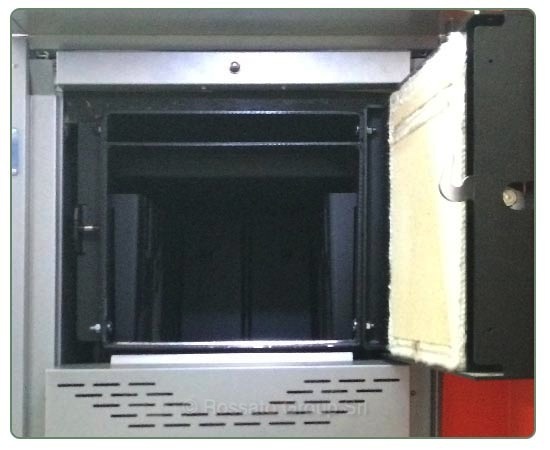 The structure of the boiler is made of sheet of high strength steel of high thickness with excellent insulation. Fill out the contact form. Tiberian boilers are based on the exploitation of wood gasification to generate the flame inverted. The overturned flame consists of a flame that instead of propagating upward, is drawn down by means of a fan located on the back of the boiler creating a depression operation, generating a perfect CO combustion2 constant. The reverse flame allows the boiler to make the most of improving combustion efficiency. Thanks to the reverse flame the formation of unburnt residues is minimized in this way are lengthened the time of cleaning ash and the boiler is always performing. Tiberia integrates a lambda probe. 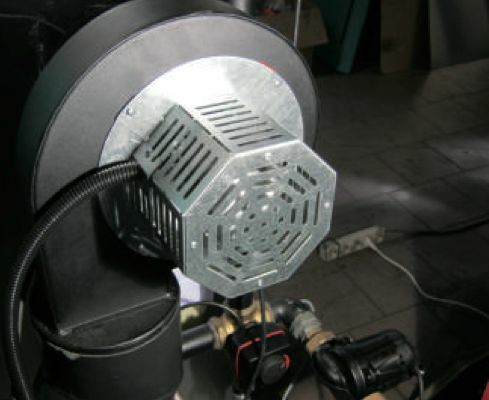 The probe measures the parameters of the combustion gases and signals the boiler to adjust the parameters of O2 within the combustion chamber, optimizing their efficiency. 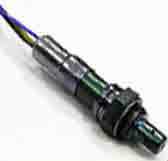 The oxygen sensor improves the efficiency of the boiler reaching more than 93%. 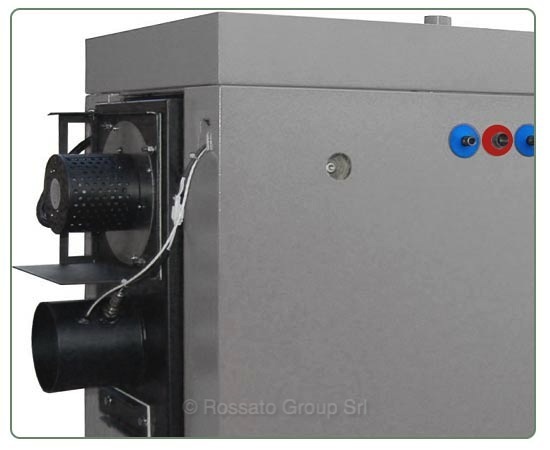 In addition the lambda sensor regulates the amount of primary and secondary air to be introduced into the wood-fired boiler, in this manner optimizes the stoichiometric ratio for complete combustion where the total oxidation of the wood. The produced heat is transmitted to the conduits and used to heat the rooms or for the production of sanitary hot water. The wood boiler is designed by adopting technical measures to ensure simple and effective cleaning of the tubes and the maximum efficiency of the boiler avoiding costly maintenance. Moving the handle fitted to the side of the boiler, they are actuated springs that descend along the exchange system and remove easily any ash residue from the walls of the ducts. The ash then falls into the compartment below for ash collection and can easily be removed. 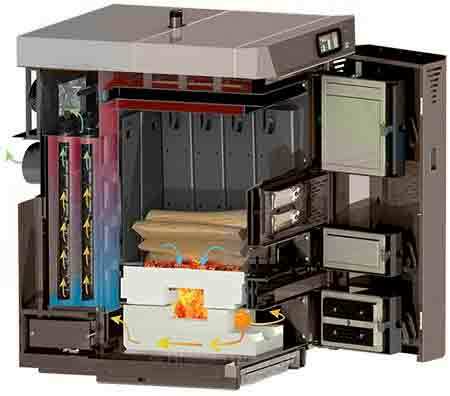 Tiberia is the wood boiler latest generation was designed with systems and technologies. 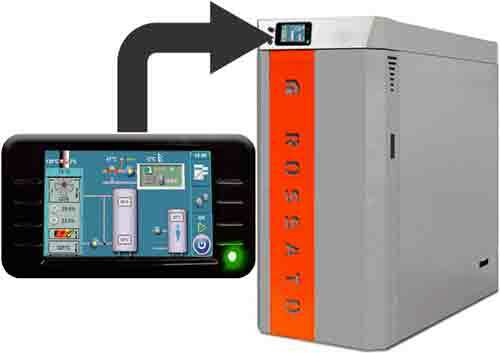 One of the pluses is its electronic management system that controls the combustion and the rule based on the conditions of use and installation. 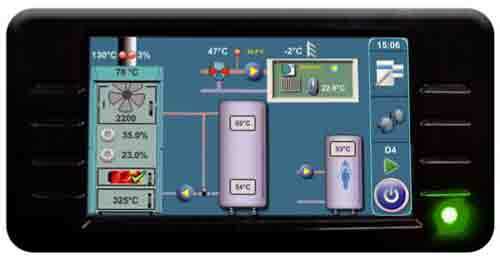 Everything is handled electronically by the programmable thermostat which also regulates the operation, planning and management of the water temperature. 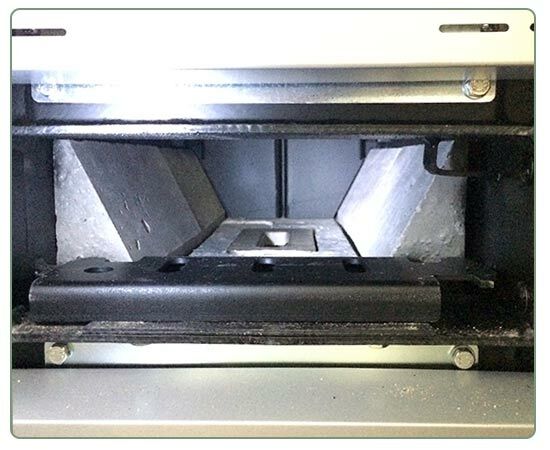 Brazier in refractory material with mixing nozzle for ejection of the high-speed downward flame. Immediately below the nozzle are present the secondary air holes that facilitate the turbulent mixing of the fuel gas with the comburent and an optimal spread of the flame. 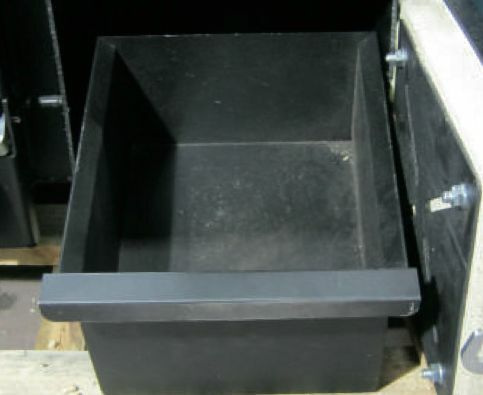 The load chamber has a coating in a double boiler protection wall. 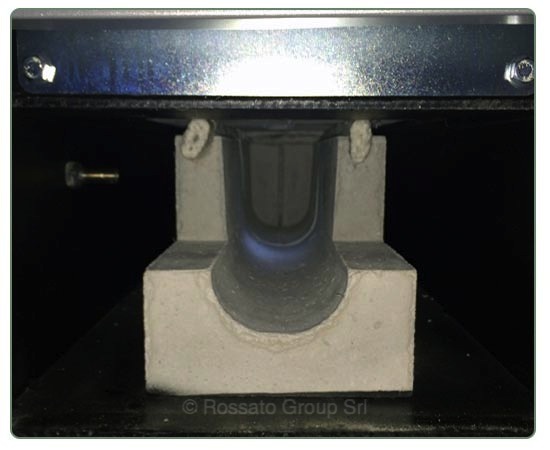 The combustion chamber has the combustion channel in shaped refractory material for a perfect diffusion of the flame. The room is equipped with a temperature probe and is easily accessible for normal cleaning operations. The fumes pass through before unloading the vertical exchanger channels with turbulators. Within these channels generating a turbulent motion in favor of an optimal heat exchange. The manual cleaning system with external lever allows with few motions, before each new charge of wood, the cleaning of the channels. Fly ash coming from the vertical exchanger after every cleaning operation ends in the side drawer collection. 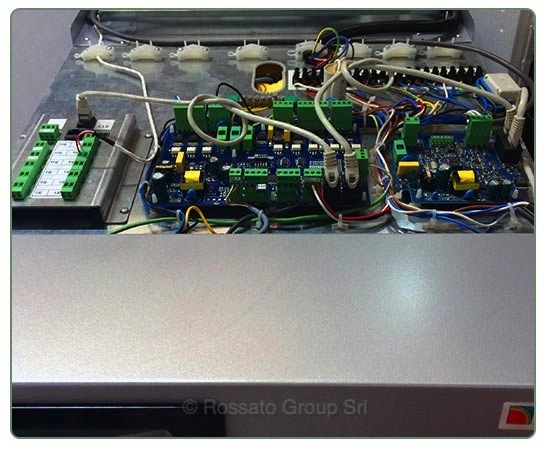 managed by the unit based on the combustion conditions. 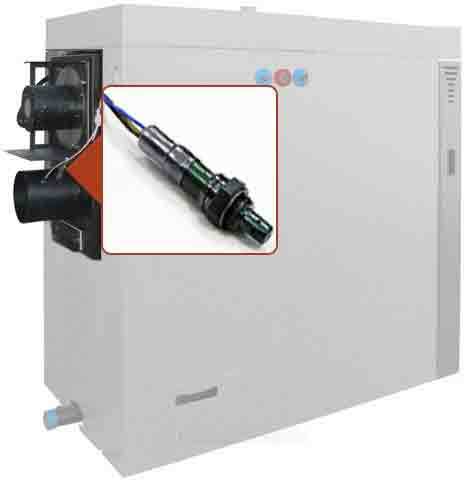 The lambda sensor is placed in the flue into the flue gas inlet channel and constantly monitors the flue gas for adjusting the intake of primary and secondary air. ● display and alarm reset. Pipe flow / return (R) 6 / 4 "
Loading / unloading (R) 1 / 2 "
For proper operation, the boiler should be positioned in a utility room in which drain into at least as much air as is required for regular combustion: we should have in the local opening with a free passage of at least 6 cm2 for each kW of installed power . The minimum cross section of the opening must not be less than the 100 cm2. The air must come in through permanent openings made in walls (in proximity of the boiler) or alternatively can also be taken from adjacent rooms as long as these are to be ventilated with external air inlet and are not used as a bedroom and bath or where there is no fire hazard such as garages, sheds, flammable material warehouses in strict compliance with the existing standards. 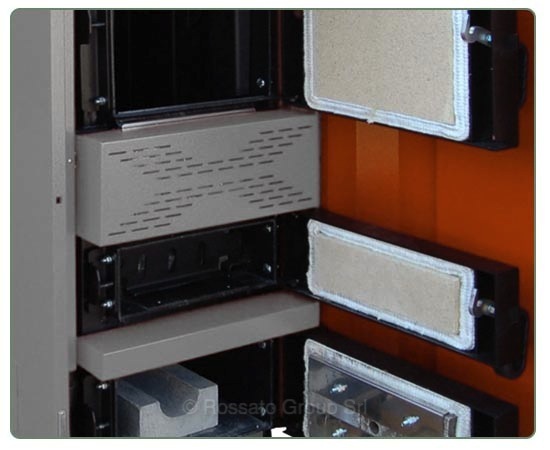 Ventilation can be done by means of permanent openings in the walls of the room to be heated, which give onto the outside or even from adjacent rooms as long as there are no doors that prevent the inflow of air into the room. To this end, on the outer wall close to the boiler must be carried out, a hole with free transit section Minimum 100 cm2 (12 cm diameter hole or square 10x10 cm). - Be kept free of obstructions. 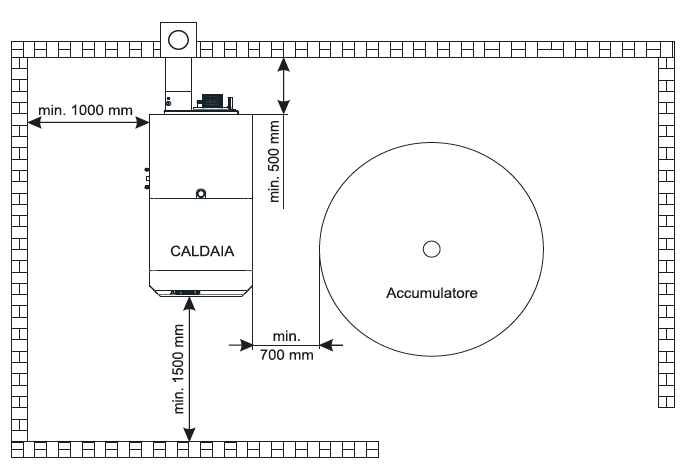 The floor of the environment in which the boiler is placed must be carefully evaluated in order to verify the ability to withstand the load of the same. 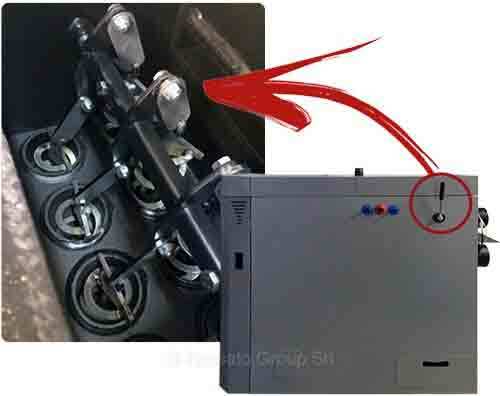 In the case also of flammable floor must be provided proper support platform: Customers should install the boiler on a base in 50 100 mm above the ground. In order to ensure the smooth progress of the maintenance operations to maintain the safety distances as shown in the following figure. The distances of respect represent a good margin of safety even in case of adjacent walls made of flammable material. 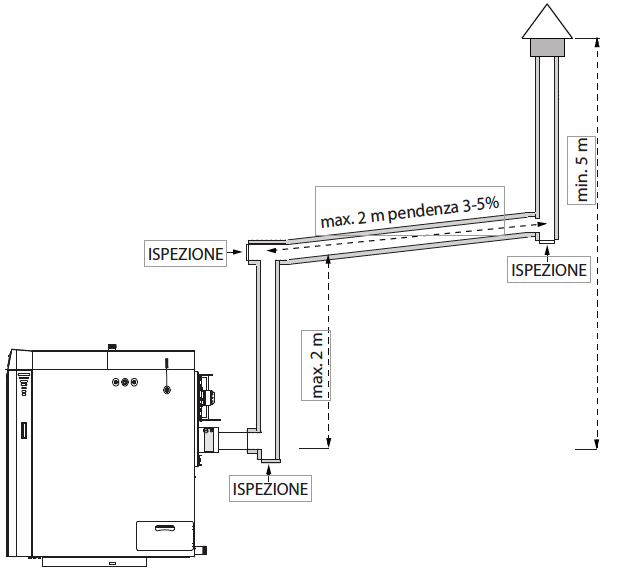 Tiberia the boiler must be properly connected to the outside to allow the flue gas into the atmosphere: the discharge must necessarily take place on the roof and not a wall or into an enclosed space with clear sky. The components of the evacuation of the products of combustion systems must be suitable to the specific operating conditions and in accordance with the relevant product standards. Moreover, all the components, including light wells must be made of materials having fire class A1 according to UNI EN 13501-1. You can use steel tubes or blacks resistant to high temperatures (up to 450 ° C). For the sealing of the tubes and their possible insulation is at least 300 ° C (silicones or adhesives for high temperature resistant materials must be used). For connecting the outside you can use an existing chimney or an external conduit. - They are not allowed hoses. 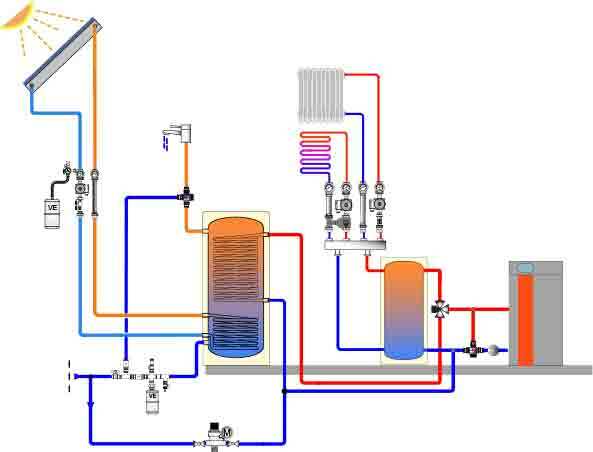 System with boiler to Tiberia for heating high and low temperature and domestic hot water production with solar thermal integration. 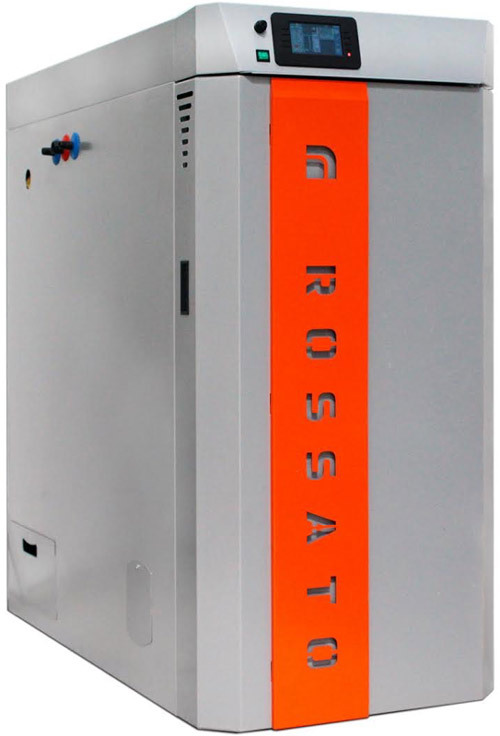 The condensation is avoided with a thermostatic mixing valve that maintains the return temperature in the boiler always above the 45 ° C.
The accumulation double coil of the DS series, for the production of sanitary hot water, allows easy connection to the solar plant is that the boiler. The three-way valve controlled by boiler thermostat diverts the flow to the plant to reach the set temperature in the storage. The SZU is a neutral body for certification, inspection, testing and inspections. 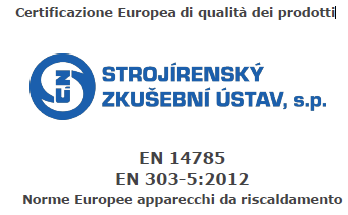 The Tiberia boiler has been subjected to the strict and scrupulous testing of the SZU obtaining 5 Class Certification according to UNI EN303-05: 2012. I register to receive updates on technical courses, events, products and regulations. Our offices will remain closed until April 26. Happy Easter!